​Themes provide the general look and feel used throughout a website. 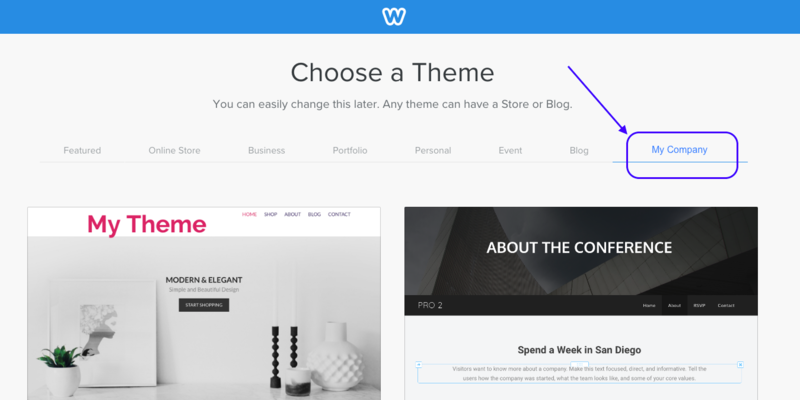 While Weebly provides a number of great themes, you may find you want to change a few things in a theme. Or maybe you want to change everything! You can do those and everything in between. You can customize a theme for just one site (as can any owner of a site or a contributor with correct permissions), or you can create global Cloud themes that all of your customers can use. Cloud themes are managed and made available using the Cloud Admin. Note: Weebly themes may be updated to accomodate changes elsewhere in Weebly. While the Editor may pick up these changes, your customized theme on a published site may not. If you suddenly notice issues with a theme on a published site, try republishing. Weebly themes can offer quite a degree of flexibility, like allowing the site owner to change colors to match their branding, or adding search functionality, or hiding areas of the site. Site owners can also change the fonts used throughout the site. Site owners make these changes from the Theme tab of the editor. As a theme developer, you decide what aspects of your theme you want to be changeable and what you want to remain fixed. Tip: If you want to get a quick understanding of how to customize and create themes, check out our theme tutorial. You use the Code Editor in Weebly to customize and create themes, accessed by clicking Edit HTML/CSS at the bottom of the Theme page. All the files that you’ll need to edit to create your theme are listed in the left panel. 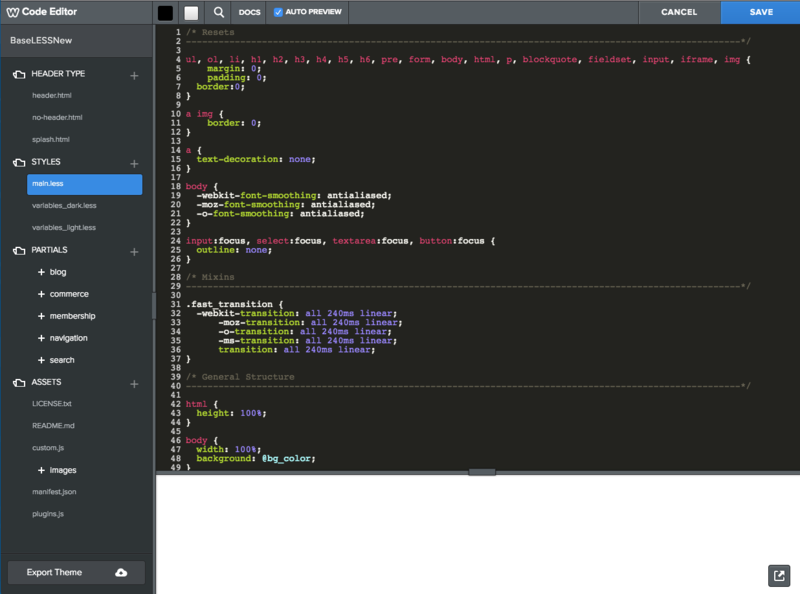 You can edit HTML, CSS, and JSON files here, or you can export all the files and use any external editor. Once done, you can import your new theme back into the editor for testing. You can upload files or create new files by clicking the + icon to the right of the associated file type. For example, you might create a new header HTML page by clicking the + icon to the right of HEADER TYPE. Uploaded and new files are automatically put in the correct directory for you. You can rename (or delete) a file by clicking the gear icon next to it (mandatory files cannot be renamed or deleted). You manage Cloud themes from the Theme tab of the Cloud Admin. 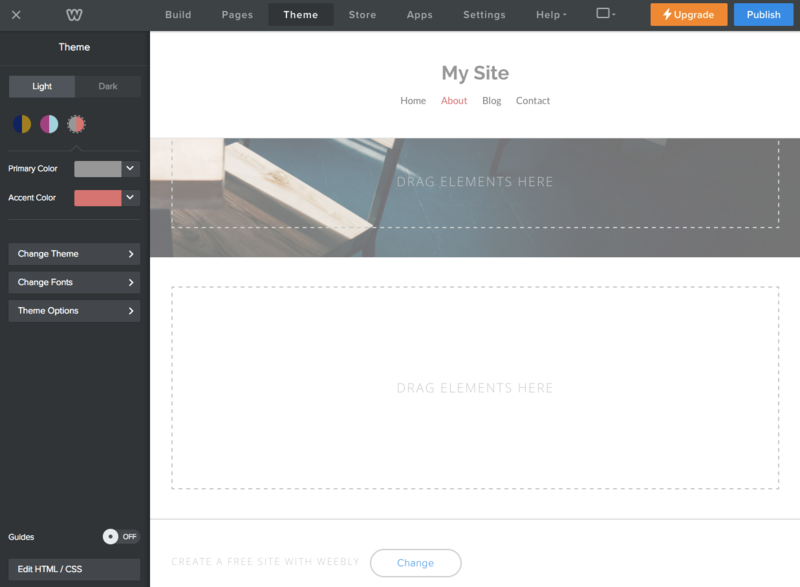 Any theme that you create from here are available to all your users and their sites. From here, you can upload new themes that you’ve created and update existing themes by either uploading a new zip or changing the name. Note: If you want to create a theme for just one user or site, you can deliver as a Zip file that they can then import. Any themes you’ve uploaded using the Cloud Admin are displayed on your company’s theme tab (displays your brand name) of the theme picker, shown when your customers go to create a site or change their site’s theme (if you haven’t customized any themes, then the tab doesn’t display). Note: If you have sub-resellers, they will not have access to your custom themes from their Cloud Admin, and their users will not see your custom themes in the Theme Gallery. If you want them to have your custom themes, you can send them the zip file and they can make it available through their Cloud Admin. When they use one of your themes and you update it, all their configurations for that theme (like palettes or options) remain. ​ If you deliver the theme as a zip file, then you can’t really update it. However, you can deliver a zip with an updated version and the user can import and apply it as though it was a new theme. All existing settings will remain. Whether you create a Cloud theme for all users, or a theme for one user, any user that is an owner of a site can customize that theme. However when they do, they must rename it as a different theme and so cannot override the original. Note: If you want to restrict access to themes, add the user as a contributor to the site (instead of as the site’s owner) and disallow access to the Theme tab.